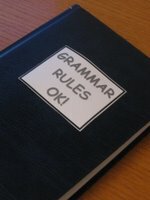 In yesterday’s post, I suggested you try and analyse the rules behind the use of contracted forms of the verb BE. Here are the rules that describe the examples included in the eight conversations. The numbers indicate some of the conversations that included an example of each rule. Unfortunately, yesterday I wasn’t able to persuade Blogger to let me use numbers instead of bullet points. Goodness knows why – it’s a site with a mind of its own. But it should be easy enough to work out which sentences I'm referring to. are is not usually contracted with nouns in the written form (4B) : WRONG : My friends’re from Italy RIGHT : My friends are from Italy or with question words (4A, 6A) : UNUSUAL : How’re you? Why’re you here? RIGHT : How are you? Why are you here? However, in the spoken form these words are usually pronounced as a contraction and informal writing will sometimes follow suit. Similarly is or are are not usually contracted in writing with words which end with the same letters (5, 3A) : UNUSUAL : This’s my wife. RIGHT : This is my wife. UNUSUAL : Here’re your keys RIGHT : Here are your keys. But again, you may see it in very informal texts. a) in indirect or reported speech : RIGHT : Can you tell me what the time is? WRONG: Can you tell me what the time’s? b) in short form affirmative answers (3B,7B) : A : Are you ready? B : Yes I am. WRONG : Yes, I’m / A : Is John here? B : Yes, he is. WRONG : Yes, he’s. But you can use them in short form negative answers, as BE is not the final word : A : Are you ready? B : No, I’m not. / A : Is John here? B : No, he’s not. So where does this leave us as far as teaching is concerned? Firstly, if you are a non-native teacher, you obviously need to know the rules yourself in order to use the language correctly when you’re talking to your students. Secondly, both native and non-native teachers need to decide what to do about the “grey areas” like where’re and who’re. Are they "incorrect" even though sometimes used? Should they be avoided at beginner level but introduced later? And finally, you need to decide if and when you are going to explain the rules to your students. With beginners, they can be pointed out when examples come up in the coursebook, or when the learners make mistakes in using them. With more advanced students who are continuing to have problems with the area, an activity like yesterday’s post can be used – give the students some example sentences, ask them to decide from their previous knowledge which examples can and can’t be contracted, and after confirming or correcting their answers ask them to formulate the rules. This type of exercise helps develop an active approach to learning, encouraging the students to notice how the language works for themselves rather than depending constantly on the teacher. What do you think? Do you find rules like this are useful, or is this just an area that has to be acquired through gradual exposure? And where do you stand on the where're what're question?